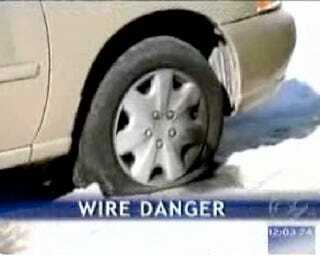 A New Jersey man was backing his car out of his driveway when one of his tires hit a downed power line and caught fire, forcing him to decide whether he should risk being electrocuted or being burned to death. When he jumped out of the car, which is something most of us would have done, he apparently got a dose of both. Thankfully, the rubber tires on the car may have prevented a serious shock and police and power crews were in the area and were able to extinguish the man and call for help. Unfortunately, the man is still in critical condition and his son witnessed the whole thing. The local power company isn't commenting, though it sounds suspicious to us that they weren't able to cut the flow going to the line.